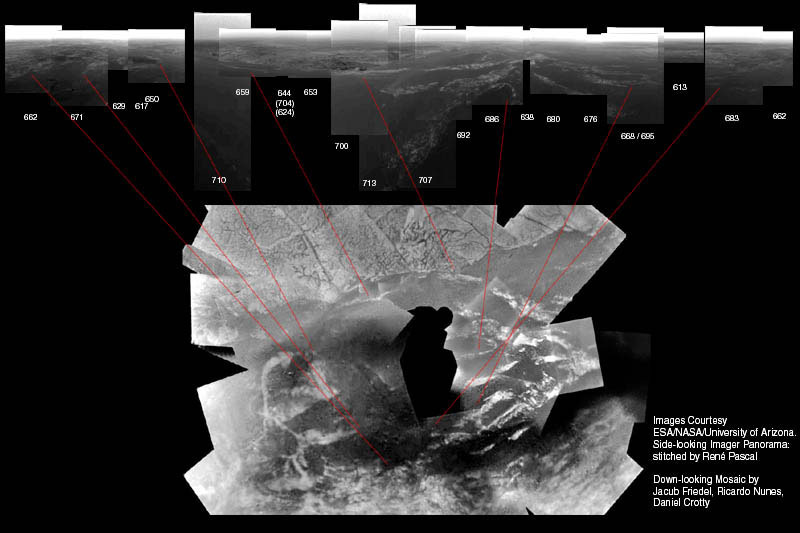 Identification of landscape features in the Side-Looking Imager panorama. The side-looking panorama was stitched by me from Huygens raw data from the DISR Side-Looking Imager. I tried to find characteristic features visible in the Side-Looking Imager data also in the down-looking mosaics, to find the positions for the individual images. seamlessly stitched panorama. Only a linear vertical scaling, but no perspectively correction was carried out on the individual images. The numbers specify the original raw data image-triplet number. Numbers in brackets point to images that show the same area but were not used in this panorama. The same panorama, but with the voids filled with an underlying vertical gray to white variation, similar to the mean variation found in the images. The same panorama, colored in a way that it may resemble the color impression one would find on Titan.